The purple sandpiper (Calidris maritima) is a small shorebird. The genus name is from Ancient Greek kalidris or skalidris, a term used by Aristotle for some grey-coloured waterside birds. The specific maritima is from Latin and means "of the sea", from mare, "sea". Adults have short yellow legs and a medium thin dark bill with a yellow base. The body is dark on top with a slight purplish gloss and mainly white underneath. The breast is smeared with grey and the rump is black. They measure 20–22 cm (7.9–8.7 in) in length and 42–46 cm (17–18 in) across the wings, and weight is from 50–105 g (1.8–3.7 oz). 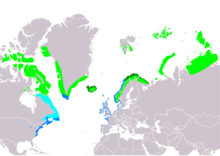 Their breeding habitat is the northern tundra on Arctic islands in Canada and coastal areas in Greenland and northwestern Europe. They nest on the ground either elevated on rocks or in lower damp location. The males makes several scrapes; the female chooses one and lays 3 or 4 eggs. The male takes the major responsibility for incubation and tends the chicks. The young feed themselves. An apparent case of hybridization between this species and the dunlin has been reported from England. In Britain, these birds occur in winter in good numbers principally along the east and south coasts, where they favour rocky shorelines adjacent to the sea. It is much rarer as a breeding bird, found only in a localised area of the Cairngorms National Park, where 1–3 pairs have bred since the 1970s. Records of breeding by this species in the UK are monitored and archived by the Rare Breeding Birds Panel. These birds forage on rocky coasts, picking up food by sight. They mainly eat arthropods and molluscs, also some plant material. The Purple sandpiper is one of the species to which the Agreement on the Conservation of African-Eurasian Migratory Waterbirds (AEWA) applies. ^ BirdLife International (2012). "Calidris maritima". IUCN Red List of Threatened Species. Version 2013.2. International Union for Conservation of Nature. Retrieved 26 November 2013. ^ Jobling, James A (2010). The Helm Dictionary of Scientific Bird Names. London: Christopher Helm. pp. 84, 242. ISBN 978-1-4081-2501-4. ^ "Purple Sandpiper". All About Birds. Cornell Lab of Ornithology. ^ Godfrey, W. Earl (1966). The Birds of Canada. Ottawa: National Museum of Canada. p. 151. ^ Sibley, David Allen (2000). The Sibley Guide to Birds. New York: Knopf. p. 181. ISBN 0-679-45122-6. ^ Millington, Richard (1994). "A mystery Calidris at Cley". Birding World. 7 (2): 61–63. Archived from the original on 17 June 2004. Wikimedia Commons has media related to Calidris maritima. "Purple sandpiper media". Internet Bird Collection. Audio recordings of Purple sandpiper on Xeno-canto.